In town for the screening of Kung Fu Panda 2 in 3D in the Greek theatre, Jack Black opened this years series of master classes at the Taormina Film Festival 2011. Somewhat struggling in his role as professor with questions on destiny, quantum theory and God, Black managed to kept it light and funny, repeatedly interrupting his lecture bellowing out (yes, thats the word) songs covering a repertoire from AC/DC to  would you believe it?  Vivaldi. Q: Kung Fu Panda has a lot to do with destiny. Do you believe in destiny? I like the way this lecture is going, I feel like a professor. Are there any more questions about life and the rest of the universe? Q: Whats your take on quantum theory? Jack Black: I love science fiction  I better get some easier questions, or this is going to end very soon! Q: Does the Kung Fu Panda character resemble you? Is it your inner part? Jack Black: Yeah, I think we have a lot in common. The panda is like a boy who loves Kung-fu with all his heart. He has his heroes, the Kung Fu idols. Thats how I was when I was a kid  I had my comedian heroes, my rock heroes. Were both bumbling innocent buffoons but in the end we achieved our dreams. Q: Is it true that the Director of the movie, Jennifer Yuh Nelson, taught you Kung Fu? Jack Black: No, she is not a practitioner herself. Q: Tell us about your favorite directors. 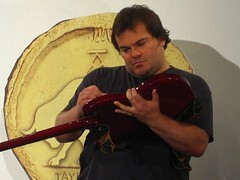 Jack Black: School of Rock was a great job of directing by Robert Linklater. I just did another movie with him called Bernie. The best directors are the ones that get the best performances out of me. Those who not just tell actors what to do, but work with them. They dont go: I am the genius, and you are the puppet! Steven Frears from High Fidelity is also brilliant. Q: Did you have fun working on Tropic Thunder? Jack Black: I did. Ben Stiller is a friend of mine from long ago - heres whats amazing about him: he gets an idea and then work on it for twenty years. He got the idea for Tropic Thunder when he was an extra in Empire of the Sun by Steven Spielberg. I dont have the kind of patience that directors have. Q: What was it like working for the Beastie Boys? And do you believe in God? Jack Black: It was awesome. When I got the call that they were working on a music video it was an automatic yes. They have been the coolest band for so long. Do I believe in God? I dont know, maybe. Every moment that we are alive is a miracle  its impossible  how does any of this work? I dont believe in organized religion. I dont believe theres any chosen people. Its getting pretty important again  I need some dumb questions. Q: Would you agree your wife has three kids at home? Jack Black: Not sure I understand  oh, of course! You mean I am the third  hm, yes, yes and yes. I love my work, its all about staying a child. When you are a kid, you are pretending to be a space warrior  I love to pretend. Acting is a trick to hold on to it. Q: Would you like to play in a movie with Monica Bellucci? we could be like Mr. and Ms. Smith  Black, Belucci, Beauty and the Beast. Q: How is your music career coming along? Jack Black: We are just recording an album. We have seven really good songs, and three really bad songs. I dont want to rush any album  everyone needs to be a masterpiece. Theres a song called Seniorita. Theres also a song called Rise of the Phoenix part 1, 2 3 which is about how we are rising from the failure of our last album. Q: Where do you love being in your free time? I love LA  I was born and raised there. I had an incredible time in New Zealand, when I worked on King Kong. Im not a great vacationer. I havent learned how to relax just yet. I like to ski. I like to eat. Q: Whats on your ipod at the moment? Jack Black: Ive been listening to a lot of Zeppelin. They are the best band in the history of rockn roll. I think theyre even better than The Beatles. I like anything that Jack White ever puts out. I was sad when they said the White Stripes was over. I love The Strokes. The new Beastie Boys is really good, not just because Im in the video. Q: What kind of advice do you have for someone who wants to get into comedy these days? Jack Black: Just go out and do it  Ive never done much stand-up comedy myself  its so scary. There are some good clubs in New York and LA. To get started, I just sort of wandered around, and just got invited. Just do what you love to do. I wish I had some better advice for you. I think people who want to get into entertainment should do a little bit of everything  do a little bit of acting, a little bit of writing, a little bit of directing. If youre just going to perform, you need other people to give you a break. If you write your own ticket, thats usually better. Q: Whats your relationship with videogames? Jack Black: Brutal Legend came along because the author called me when I had just finished his other game. I love videogames, and I wanted to act in a videogame. I think its the next frontier. Theres some really fantastic acting in them. Its the future. Q: One could argue youre not in the movie were going to see here tonight because theres voice over in Italian. Whats your opinion of voiceover? Jack Black: I feel an ownership in the role because I was there when the role was created. I shaped the character. It was a collaborative effort with me and the director and the writers. So I still think its part of me up there. I feel they stole all my faces and body movements as well. Q: What were you like when you were little?